For obvious reasons I like this syntax much better. Unfortunately it is only available for Windows Store app and Windows Phone 8 test projects, but not on other platforms. If you're like me and would like to have it supported everywhere, consider voting for the suggestion at User Voice. Test runners handle these tests similarly to other MSTest data-driven tests, i.e. only a single test is shown in the list. I'd like to give another word of caution at this point. ReSharper as of version 8.0.2 has a bug which causes some of the test cases to be skipped, thus not detecting a failed test case. 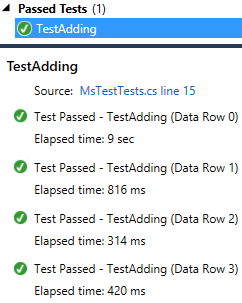 You either need to run the tests in debug mode or use Visual Studio test runner instead. I've reported the bug and the fix seems to be coming with the next release.